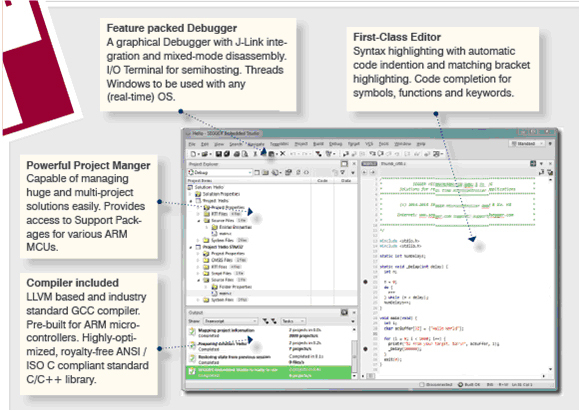 SEGGER Embedded Studio is a streamlined and powerful C/C++ IDE (Integrated Development Environment) for ARM microcontrollers. It is specifically designed to provide everything needed for professional embedded development: an all-in-one solution providing continuous workflow. Windows, Mac OS X and Linux support. Powerful Project Manager, even for huge projects. Package-based Project Generator for all common microcontrollers. Pre-built C/C++ Compiler, GCC and LLVM included for an immediate start. Royality-free ANSI / ISO C compliant C library for embedded systems. Feature-packed Debugger with seamless J-Link integration. 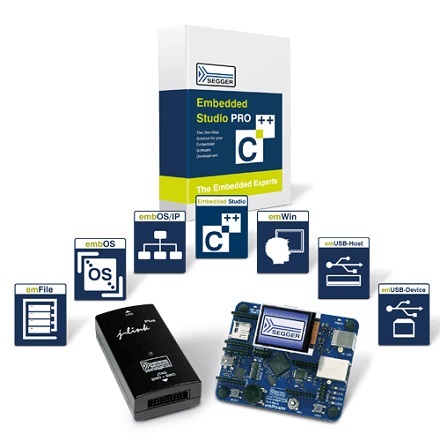 Embedded Studio PRO is an all-in-one embedded development package. It includes a powerful integrated development environment (Embedded Studio), a complete embedded software suite (RTOS, GUI, USB-Device, USB-Host, TCP/IP, File System), the industry leading J-Link PLUS debug probe, and a Cortex-M based emPower development board. This streamlined package works out-of-the-box. Start programming your application immediately and rely on The Embedded Experts to answer any questions during your development. Components of Embedded Studio PRO package Embedded Studio PRO is an all-in-one embedded development package. It includes a powerful integrated development environment (Embedded Studio), a complete embedded software suite (RTOS embOS, GUI emWin, USB emUSB-Device and -Host, TCP/IP embOS/IP, File System emFile), the industry leading J-Link PLUS debug probe, and a Cortex-M based emPower development board which is based on a Kinetis K60 eval board. This streamlined package works out-of-the-box and is shipped in object code. Start programming your application immediately and rely on The Embedded Experts to answer any questions during your development. It Simply Works! 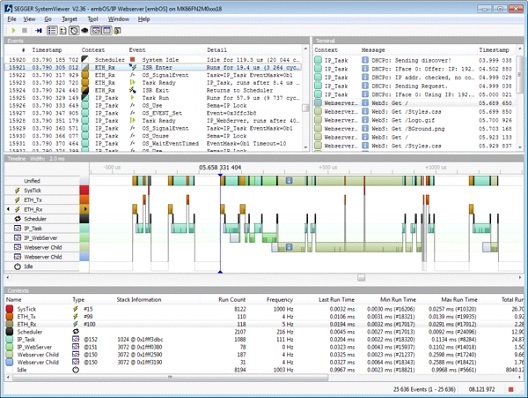 SEGGER SystemView is a real-time recording and visualization tool for embedded systems that reveals the true runtime behavior of an application, going far deeper than the system insights provided by debuggers. This is particularly effective when developing and working with complex embedded systems comprising multiple threads and interrupts: SystemView can ensure a system performs as designed, can track down inefficiencies, and show unintended interactions and resource conflicts, with a focus on details of every single system ticks. SystemView can record data from the embedded target system while it is running. The recorded data is analyzed and the system behavior is visualized in different views. All system information is sent by the application and is part of the recording. The information is shown in the window on the top right and includes the application name, the underlying OS, the target device and the timing information. Additional information about task switches and interrupt frequency provide a quick overview of the embedded system. With the Timeline and the Events window the whole system execution can be visually analyzed. SystemView PRO extends the capabilities of the free tool SystemView. It does not only enable unlimited recording of events, but unlocks more powerful means of complete system analysis. The free version of SystemView is limited to recording and analyzing one million events. SystemView PRO lifts the one million event limitation and enables Unlimited Recording. While it is usually sufficient to record several seconds or even minutes of a system and capture all important events, it can be helpful to run long-time tests on a system to verify if it behaves as expected. Some timing related issues might only occur after hours of system up-time. With SystemView's Post-Mortem Mode the last events before such an issue happens can be stored, but it might be necessary to scroll back further in time and see more of the system activity. Unlimited Recording provides full statistics of all contexts in long-time tests and allows a complete analysis of the system from startup up to the occurrence of any issue. In addition to save the whole recording, SystemView PRO also features extraction of interesting parts to be saved separately for documentation or later analysis.